I like to feature both experienced and new teddy bear artists on the site, so I was delighted when I was contacted by Elizabeth Chamberlain the creator of 'Bears to Cherish'. Elizabeth has only been making her bears for a short while but already she has entered one of her creations to the TBAAF 2013. Here is a short interview with Elizabeth about her bears. I understand that you used to make felt animals before you moved in to teddy bear making. Why did you decided to try your hand at becoming a bear artist? Yes I used to be a needle felting artist, they were commission pieces mostly of peoples pets, and I did quite well with it too!!. My right hand went numb about 17/18 months ago , it was found I had a disc missing in my neck after I had a MRI scan and the constant stabbing of the felting needle was causing my problem. I have crafted for as long as I can remember, even as a child, one day I saw one of my friend post a picture of a Beautiful bear online. Something inside me said I Bet I could make a bear!! 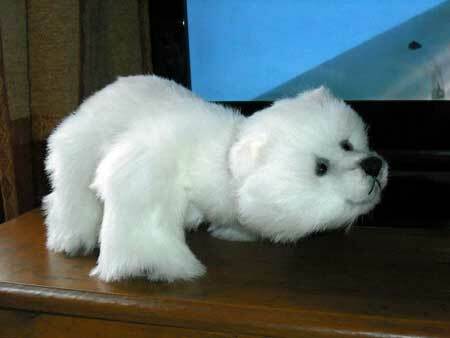 I have needle felted bears in the past so the switch from needle felting to hand sewing bears came to be. You have only been making teddy bears for a short while, What are you hopes and aspirations for your bears in the future? I have been a Bear maker/Artist for just under 1 year and I have come a VERY long way in that time already, I am a perfectionist in anything I do, My aspirations are to be One day as well known as Kelly Dean the Wonderful Bear Master, Linda Down is another bear artist I Love, And Monica Spicer, who's wonderful tutorials helped me to the standard I am today in such a very short time in the Bear world . I have also entered the TBAAF 2013 Awards this year , my first time at entering any bear awards , I hope to enter a few more Bear awards this year, I would be over the moon if I were to be placed let alone win a competition !! What would say is the inspiration for each of your bears? For Instance do they have a particular style? once he/she is sewn up, jointed /stuffed, and the final tweaks made, I always say OH hello sweetie what would you like to finish you off? My lovely OH nearly always names my Bears, he gives them perfect names!! I find stitching the ears onto a bear the hardest and my least favourite thing to do. What would you say is the trickiest part of making a teddy bear is for you and do you have a favourite and least favourite part? I used to find sewing on the ears the hardest part too!! but a very good bear friend of mine gave me the most wonderful tip of sewing on ears and now I have perfect ears every time! 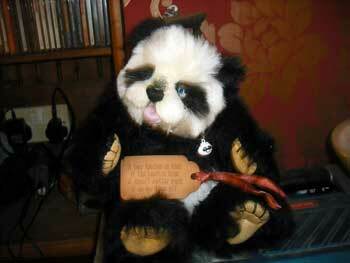 For me my Favourite part of making a bear is the Face, I just love to watch a round ball of fluff come to life,. adding the eyes, sewing the nose, I use nose shine on some of my bears,( I love a shiny bear nose) , attaching the ears, adding the final touches then suddenly there he/she is!! Everyone has their own personal relationship with teddy bears I find, there always seems to be a story behind why they are loved so much. Tell us why you love our cuddly bear friends so much? 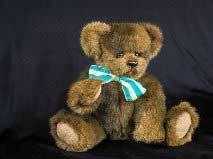 Perhaps you had a favourite bear as a child which holds special memories for you. You know I don't think I had a bear as a child, I don't remember having 1 , I came from a very large family of 8 and toys were not something we got very often, at Christmas I always got painting by numbers, craft type presents , it is only since I have become a adult my Love of bears came to be. And now that I make them myself I can totally understand the appeal Bears have for all ages. 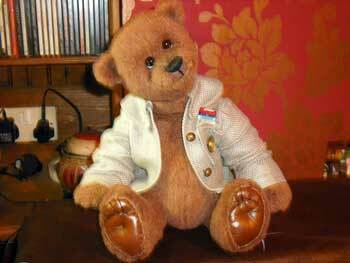 Of all the bears you have made so far do you have a particular favourite bear which you either have kept for yourself or whished you still had? The Bear I have kept and will never part with is my Beautiful Boo !! he will be with me forever and will be passed on to my Son's children if he ever has any that is . Is there anything else you would like to tell our visitors about your bears? When I was trying to come up with a name for my bears, I thought long and hard what to call them? Then it stuck me !Bears are Cherished by people that love them and I want MY bears to be Cherished by people who buy them TOO, So that's how by Bears got there Name Bears To Cherish By Liz chamberlain .